The measurement of the conformal coating thickness on a printed circuit board (PCB) to ensure internal and international standards are met is now a critical factor in conformal coating process control. 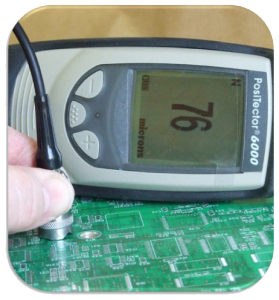 There are several methods for measurement of conformal coating thickness and they fall into two categories. These categories are wet film measurements applied during coating application and dry film measurements made after the coating is dried enough not to damage the coating. Measurement of the conformal coating after application is complete and the coating is dry enough to handle is achieved using a non destructive technique using eddy currents. A system like the Positestor 6000 offered by SCH is extremely quick and accurate to ±1 um at thin films of 25-50 um. Using a gauge and flying probe for the measurement the system is extremely easy to use. Placing the test probe head flat on the surface of the conformal coating, the measurement is almost instantaneous and provides an immediate repeatable result for thickness measurement of conformal coating. Test coupons are the ideal method for measuring the coating thickness, whether is it spraying or dipping, and can be kept as a physical record of the performance. Apply the coating to the test coupons at the same time as the circuit boards provides a permanent measurement and an accurate guide to the coating thickness. Contact SCH for further details on the Positest Conformal Coating Thickness Measurement system. 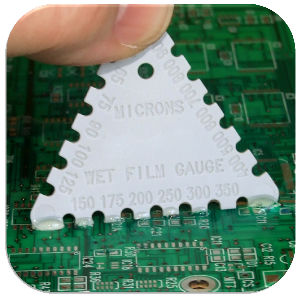 An alternative method to dry film measurement which is completed after application and drying of the conformal coating is the wet film technique which allows operators to ensure quality control while the coating is still wet. Applying too much coating can be expensive. Also wet film measurements are useful for conformal coatings where the dry film thickness can only be measured destructively or over application of conformal coating could be problematic. The wet film gauges are applied to the wet conformal coating and the teeth indicate the thickness of the conformal coating. The dry film thickness can then be calculated from the measurement based upon the solid resin content of the conformal coating. The wet film gauges are sold in bags of 200.